As I looked over what I had baked for Easter something didn't feel right. It felt like there should be more. I had made Banana Bread, Cookies, White Chocolate Brownies, and my "Fancy Snickers" (recipe forthcoming), but it still didn't seem like enough. Even after deciding I was finished and had cleaned up, I began to look through my bookmarked recipes to see if something stood out that wouldn't take too long to make. Peanut Butter, check; Sugar, check; Corn Syrup, damn... wait.. honey? Yup :); Corn Flakes? Boxes (plural). 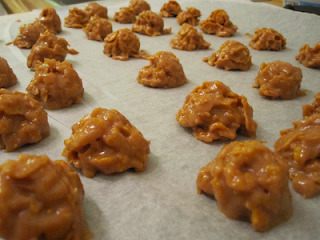 I halved the recipe (thankfully) and in 10 minutes ended up with about three dozen of these little buggers. It took longer for me to take out all of the ingredients than it did to actually finish. The other thing that took a lot longer than “baking” these? Figuring out what to call these things. They're not really cookies, right? So what are they? Cereal treats? That evokes the idea of Rice Krispies Treats. So, after far too much thought, I chose “Cereal Drops." Uhm, I guess because, well, that's what they are :). I digress, onto the important stuff: taste, which is awesome! :). With these drops (see) it's all about the melding of peanut butter and honey. Although the original recipe uses corn syrup I would definitely recommend honey instead. It adds such wonderful flavour. However, with all the sugar I was a tad worried that they would end up being too sweet, but this wasn't the case at all. The cornflakes definitely help balance the flavour and as a bonus they also retain most of their crunch. This is especially nice because you get a bit of crunch with a soft peanut butter and honey binding. Almost like a crunchy fudge. So stick with a flaked cereal because I don't think you will achieve the same texture balance with anything else. If you're feeling a little saucy, drizzle on some chocolate or go buck wild and just dip the suckers. I decided against adding anymore chocolate to an Easter celebration and I'm kinda happy did. The addition of chocolate may have easily blown my brain out the back of my skull but I think that in such a small bite chocolate would have been one strong flavour too many. Oh, and allow the drops to cool completely before tasting, otherwise the honey overpowers the peanut butter and leaves that funny honey aftertaste (yeah, that one). I'm quite happy I decided to make these, at the very least it's always nice to have another super quick and tasty peanut butter recipe on hand. But as I was preparing to leave for my Grandparents' place for Easter Linner (Lunch/Dinner) it dawned on me that I had become my Grandmother :). You see, it was at this point I realized exactly how much I had made (not to mention there woud be more there). My Grandmother is notorious for always making way too much food (no complaints from me :) ), and it seems I have inherited this trait (though I only do dessert, and my skill set is nothing compared to hers). Unlike my Grandmother, I am aware (or am becoming aware) that I might have a problem, which is a great thing. It will give me the chance to prepare for Thanksgiving by renting a trailer to transport the dessert course :). Have ready a large cookie sheet lined with parchment paper and add cornflakes to a large bowl. In a medium saucepan set over medium heat, add sugar and honey and stir to combine. Continue to stir until mixture comes to a full boil. Remove from heat and stir in peanut butter until completely combined. Pour mixture over cornflakes and gently fold everything together, being careful not to crush the corn flakes and making sure to coat them completely. Scoop by rounded teaspoonfuls onto prepared cookie sheet (Psst... cookie scoop :)).